They now directed their course to Surinam but not having sufficient water for the voyage they were soon reduced to a mouthful of water in the day; their numbers daily diminished by thirst and famine and the few who survived were reduced to the greatest weakness. They at last had not one drop of water or any other liquid, when, to their inexpressible joy, they anchored in seven fathoms of water. This tended to revive exhausted nature and inspire them with new vigour, though as yet they had received no relief. In the morning they discovered land, but at such a distance that their hopes were greatly dampened. The boat was however sent off, and at night returned with plenty of that necessary element. But this remarkable deliverance produced no reformation in the manners of these unfeeling and obdurate men. 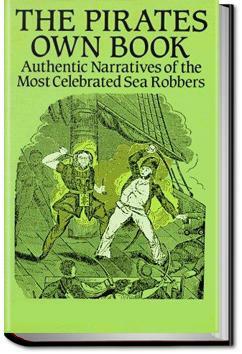 Very interesting book of pirates and their adventures. Fascinating stories of personalities usually excluded in history class. A bit long. This is my 1st pirate book I read. Very interesting and the documented accounts were very revealing on how violent they were. I shall read another one in future. First hand accounts, diary entries and court documents make up these tales of real pirates. Originally published in the 1800's, it's a fascinating look at life on the high seas. Be forewarned: the writing is of the time so the grammar, spelling and syntax take some getting used to. Ordered it because we are doing a pirat theme this yr. for our home school. Although a bit dry in places, this was a very enlightening book to understand the origins and real acts of pirates. It puts the Somali pirates of today into a perspective that will not win them any friends. part history, part lore, all from the mouths and pens of pirates. i've had this book perhaps longer than any other book on my shelf. my real bookshelf, that is.